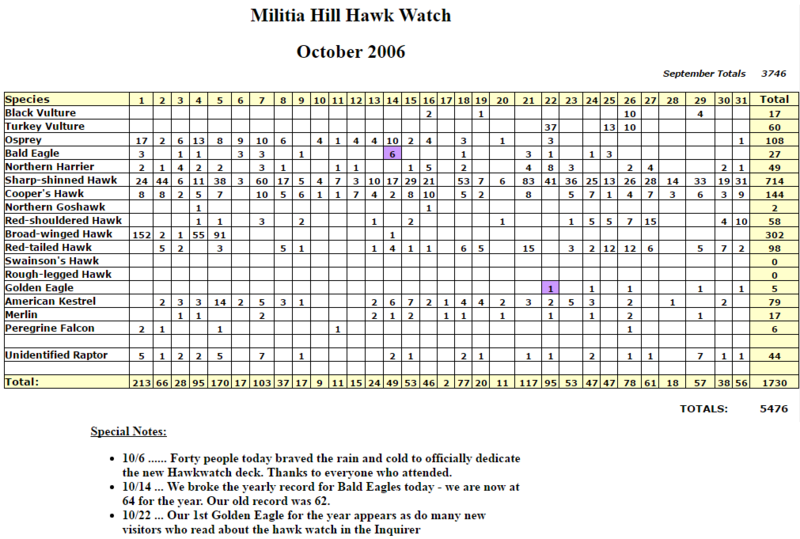 The annual Halloween picnic, attended by nearly 70 people, marked the official close of the 2006 Hawk Watch at Militia Hill. Photo albums of current and previous years were on display. Good spirits, glorious weather, camaraderie and lots of good food made the occasion a fine way to end the season. The new deck, completed just in time for the September 1 start of the Hawk Watch, was enthusiastically received. Everyone agreed that the view is quite spectacular. The deck was officially dedicated on October 6. Michael DiBernardinis, Secretary of the Department of Conservation and Natural Resources (DCNR) was present for the ribbon cutting. 42 people showed up for the ceremony, held, unfortunately, in the rain. DeBernadinis had been responsible for providing funds, from Growing Greener, for building the deck. The Regional Park Office contributed an all-weather educational sign, which illustrates field marks of Osprey, Bald Eagle and Turkey Vulture. It will be installed on the lower deck As part of our ongoing effort to educate visitors about the birds, we hope to eventually have additional interpretive signs which will compare accipiters, buteos and falcons. 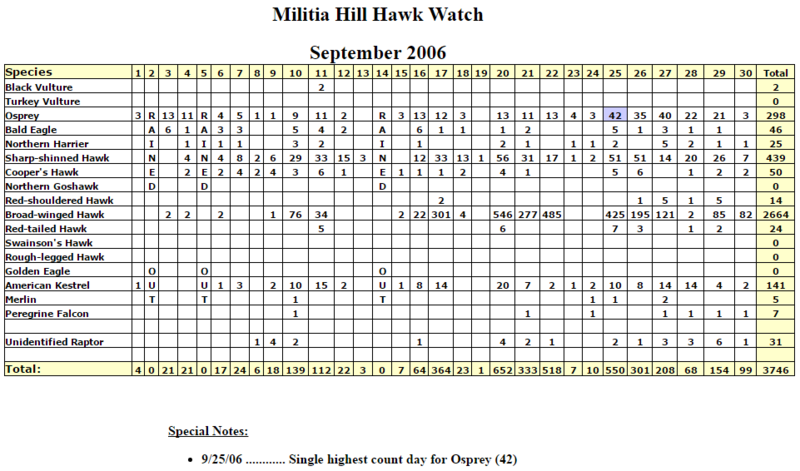 While the number of Broad-winged Hawks fell short of a hoped-for bigger total, compilers did tally a total of 2966 for the duration of the watch. As if to make up for the broadwing shortfall, there were 73 Bald Eagles, a Militia Hill record, and over 400 Ospreys, another record. There were also 5 Golden Eagles. A run-down of some of the more memorable moments follows. To open the hawk watching season, 38 people showed up in the rain on September 1. The first bird sighted that day was an American Kestrel. This was encouraging because kestrel numbers have been down over recent years. It rained on September 2, but on September 3, 6 Bald Eagles were counted. A large number of people visited the hawk watch on Labor Day, and were rewarded by another Bald Eagle sighting. By September 16, 21 Bald Eagles had been counted. On September 12, Hawk Mountain and the other ridges got huge numbers of Broad-winged Hawks. Our biggest day was September 20, when we had a total of 652 migrating raptors, 546 of them broadwings. September ended with a total of 3746 birds. Early October saw more Bald Eagles. 9 were tallied by October 7, and on October 14, there were 6 more. These 6 broke the previous record of 62 for the year. A Northern Goshawk appeared on October 4, and a second on October 16. By October 18 we had tallied over 400 Ospreys. The first Golden Eagle was spotted on October 22, and a second one on October 24. By the end of October we had seen 5 Golden Eagles. The total number of raptors for the 2006 season was 5467. 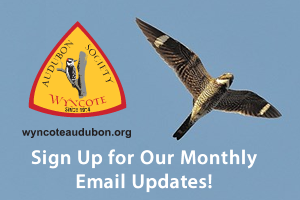 75 people came to the Hawk Watch on October 8 to see falconer Tom Stanton and were able to get up close and personal looks at his 8-month-old Peregrine Falcon and Harris’s Hawk. As is always the case, there was a lot more going on around Militia Hill besides hawk watching, although that is of course the focus. A number of notable birds other than raptors were seen over the two months. In August, before the Hawk Watch began, Andy Fayer and others had a Common Nighthawk count going. In September Bill Murphy found a Red-headed Woodpecker near the top of Ridge Road. An Olive-sided Flycatcher was also sighted in the park. Brown Thrasher, Eastern Towhee, Ruby-throated Hummingbird, American Goldfinch and assorted sparrows were seen at the bird feeders. Common Loons, Snow and Canada Geese flew overhead. In other parts of the park over 15 species of warbler were seen this fall, including Blackburnian, Bay-breasted, Northern Parula, Canada, Magnolia, Nashville, Worm-eating, Black-throated Blue and large numbers of Black-throated Green. There was also an assortment of vireos: Yellow-throated, Red-eyed, Blue-headed, Philadelphia. In October, the Mill Road part of the park was a great place to see a variety of sparrow species at close range: Song, White-throated and White-Crowned, Swamp, Chipping, Lincoln’s, Dark-eyed Junco and Eastern Towhee. During the summer, Bill Murphy led butterfly walks in the park. Participants identified and photographed many different species. A 12” King Snake, which can grow to 82”, was found and photographed on the park road. Mushroom aficionados, led by Eva Abraham, found many different species in the park including Hen in the Woods, Chicken Mushroom and Dead Man’s Fingers. Several school groups visited the Hawk Watch. Among them were students from Arcadia University, Miquon School and Souderton Charter School. Volunteers explained about bird migration and helped students identify the birds. The Philadelphia Inquirer prominently featured Militia Hill and Rose Tree Hawk Watches on Saturday, October 21 with an article entitled “Hawkspotters” by Robert Strauss. This drew about 100 new people to the Hawk Watch. Capped by the Halloween picnic, 2006 was another memorable year on the Hill. Our Hawk Watch is a group effort. Many people help to make each season a success. The 23 compilers who faithfully take their shifts, often under unpleasant weather conditions. All those who have brought cookies, candy and other treats to help keep us happy. The park staff… especially Josh Bruce, Steve Cardell, Craig Walter, Larry Gallagher, Fred Hayes, Jai Jackson and Cynthia Biser for all that they do for us. Jamie Stewart for including a section on the park and the Hawk Watch in an upcoming book of photographs on theWissahickon Creek which will be published to celebrate the 50th Anniversary of the Wissahickon Watershed Association. Everyone who has helped scan the sky and found a migrant for us to count.